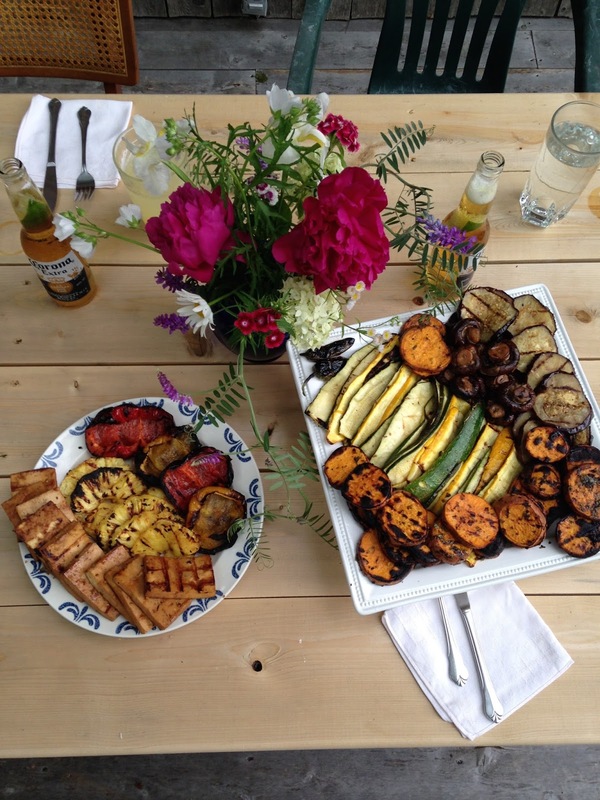 On my first grilling post, I used this recipe for tofu, mushrooms and pineapple. I planned to have it be a bourbon glaze, as the original recipe calls for, but we were out of bourbon, and instead of being bothered to run to the store again five miles away on the 4th of July, I subbed fresh pineapple juice for the bourbon. This is a recipe my mom came across, I think in a newspaper clipping or something to that nature. That recipe, made with the bourbon, too, has been tried and true. It is amazing on salmon! This recipe was so darn good, I am salivating just thinking about it. Can someone please cook this up for me for dinner tonight?! Ingredients: Original recipe is intended for 8, 6 oz. salmon filets. It can also be used for chicken breasts or pork tenderloin. As I said above I have also used it for the vegetarian items listed below. The recipe makes enough to glaze for the amount I have listed. Step 1: Combine all the ingredients in a medium size mixing bowl, and mix well. Layer a large sealable leak proof container first with mushrooms, then tofu, then the pineapple. Pour the bourbon mixture over the mushrooms, pineapple, and tofu. Cover the container tightly and slowly mix by turning container up and down. Step 2: Let marinate in the fridge for at least 2 hours, mixing every 30 minutes or so. Step 3: When you are ready to grill, remove the items from the glaze. Place the mushrooms tops down on the grill. Place the other items on the grill and cook all over a low or medium-low flame. The mushrooms may need longer to cook than the tofu and pineapple. You will know the mushrooms are done when they are soft and slightly shriveled. Remember to flip the pineapple and the tofu, this is not necessary with the mushrooms. As this was all vegetarian, I also made a reduction by cooking down the left over glaze in a skillet on the stove. That way I could pour it over the veggies and tofu for a little added yum. See my other grilling recipes to accompany this main staple and make a real feast of vegetarian delights! Note: If using this for salmon, you can make it on the grill, skin side down. Or you can make it in the broiler. Place salmon filets on a cookie sheet with an edge, skin side down. Pour remaining glaze over the fish. Cook in the broiler until flesh of salmon begins to separate just slightly. (about 7-12 minutes). Finish by sprinkling with sesame seeds and sliced scallions.